My love, along with cowboy music and cowboy poetry, is western swing! The first western swing artist I got to know personally was Carolyn Martin. We were at the WMA Festival (I think it was called then) in 2007. Carolyn and Dave showed up at a jam session and many people there did now know her. Most were cowboy singers and had not met Carolyn at the point. When that girl started singing everybody in the lobby of the Marriott stopped whatever they were doing and listened! All over you could here, “Who is that?” “Where did she come from?” “Listen to that voice!” During the next three days Howard and I visited with Carolyn and Dave Martin quite a bit and started a nice friendly relationship. When I started doing the radio show I played Carolyn’s “Swing” CD quite a bit and thought it was wonderful! ‘Cause it is! Then she released “Cookin’ With Carolyn!” What a great CD! I like every song on it!!! 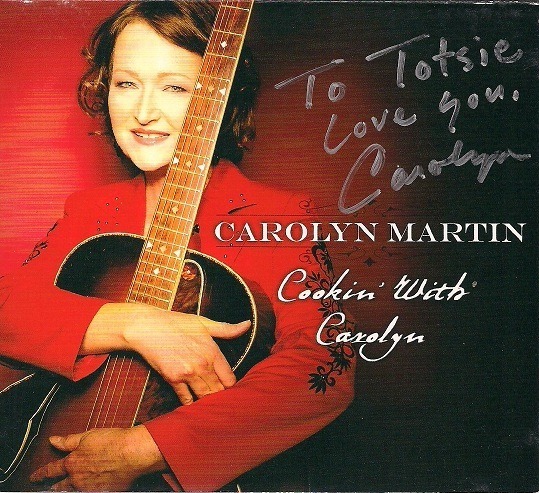 Carolyn wrote “That’s What I Call Cookin’,” (with Dave Martin) and “Skillet Blues” (with Norma Jane Struthers). She also sings, “”Spring Cleaning,” “Someday Soon Sweetheart,” “The Yodel Blues,” with Norma Jean Struthers, “Nothing Better To Do,” “If I Knew You Were Comin’ I’d’ve Baked A Cake,” “Dream,” “Straighten Up And Fly Right,” “It’s All About You,” “Nearness Of You,” “People Will Say We’re In Love’” and “Columbus Stockade Blues.” The CD has received awards and nominations and this girl has gone places. With original songs and some good old standbys, Carolyn’s voice along with the voices of Norma Jean Struthers and Riders In The Sky, incredible musicians and a wonderful production, make this a very entertaining CD. If you don’t have it yet…log on to http://carolynmartinmusic.com and find out where to buy it! You’ll love it! Thank you Carolyn Martin for the wonderful music! And for sharing it with me to share with my radio audience!